Kel'Thuzad was added in the Curse of Naxxramas Adventure. He is available from Wing 5 - The Frostwyrm Lair which opened on August 19th, 2014, and is obtained after defeating the adventure boss Kel'Thuzad. Kel'Thuzad can abuse the AI in many PvE boss fights when combined with a Taunt minion - the AI has no idea how to handle it and ends their turn! 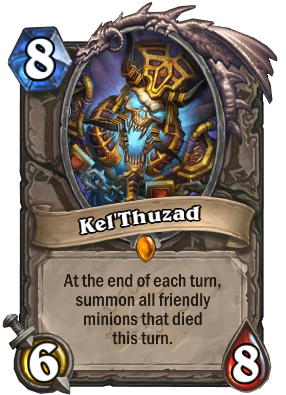 His effect activates at the end of turn phase, which means minions who die from other end of turn effects such from those found on Ragnaros the Firelord and Power Overwhelming will not be resurrected by Kel'Thuzad. Minions are returned to the board in the order in which they died. Need help conquering the Curse of Naxxramas Adventure to obtain Kel'Thuzad? Head on over to our Curse of Naxxramas Adventure Guide! I still love this card! One of my favorite cards ever. I really played him a lot until the beginning of Standard. Even on wild, i use to play him a lot. I'm considering on back to play him. His line is the best by far. So happy Naxxramas is back so I can get this cool card! Bit late on that, bud. I bought it months ago with money and I don't regret my purchase. Could also be good with Awaken the Makers. Could be similar to N'Zoth, the Corruptor, Kazakkus's Ichor Of Undeath Potion Choice, or to Onyx Bishop with Brann Bronzebeard. But out of these, Kel'Thuzad is my favorite. Kel'Thuzad is CRAZY. I played one unfortunate Warlock who used Void Terror on a Venture Co. Mercenary, he had Kel'Thuzad out, and he REVIVED IT! He conceded, and so would i.
and... how is that a bad thing? Wow, what were you thinking when you wrote this back in 2017, you made my day, +1. I love his entrance quote. Probably my favorite.